"C'mon, little ginkgo. The tree’s trunk is as thick as a finger and it’s ten feet from a playground. 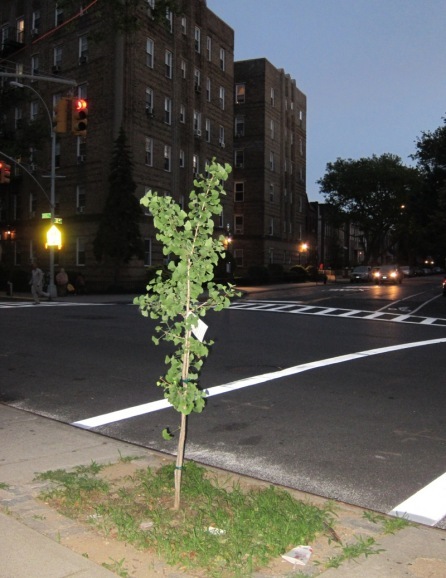 NYC is trying to plant a million trees before 2017. We are rooting for this one in particular." To make sure that trees succeed this time around, the city’s Department of Parks and Recreation asked the private landscaping companies under contract to plant for MillionTreesNYC to provide maintenance and care — including one inch of water per week, pruning and cultivation — for two years, the most critical time in a tree’s early life. But the new trees’ survival is ultimately in the hands of local caretakers: residents, business owners and anyone else with an interest in the trees’ welfare.